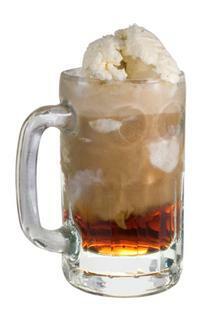 Turn a childhood favorite into an adult beverage when you make a root beer float with Baileys Irish Cream. Baileys Irish Cream is a unique liqueur that contains a combination of whiskey, real Irish cream, sugar and a touch of cocoa. This orginal Baileys blend became quite popular and led to the creation of additional flavors in mint chocolate, caramel, hazelnut and coffee. The rich creamy texture of Baileys makes it the perfect ingredient for creating an adult root beer float beverage whether or not you choose to add real ice cream to your cocktail. It's not clear exactly who first invented this cocktail, but there's definietly more than one way to make a root beer float with Baileys Irish cream. So, give each of the following recipes a try and decide which is your favorite. For the best results, thoroughly chill all of your ingredients and glasses beforehand to ensure each drink is truly a frosty treat. The Kahlua in this recipe lends a nice coffee undertone to the drink that is surprisingly pleasing. In your chilled mug, combine the Kahlua and Baileys, and then fill the rest of the mug with the root beer. This may be the simplest root beer float cocktail recipe, but it's incredibly tasty. Follow the directions the first time you make it, and then experiment with the ratio of Baileys to root beer to find your perfect flavor blend. Using a tall mug, fill it 1/3 full of crushed ice. Next, add the Baileys approximately 1/4 of the way up the glass. Fill the rest of the glass with the root beer and give it a little stir with a swizzle stick. This drink packs a bit of a wallop, so be forewarned! To a large mug, add the ice cream and all three alcohols. Slowly pour in enough root beer to fill the glass without making it overflow. In a large shot glass, simply pour in the ounce of schnapps, and then add the Baileys Irish Cream up to the top. As you can see, there are a number of ways to make your float cocktail, so if you see elements from a couple of recipes that intrigue you, take a chance and experiment with them. You may have a couple of failures before you hit on the right combination of ingredients and ratios, but you may eventually come up with an even better cocktail than the one with which you started.